Linda Evans for Forever Krystle perfume for women. 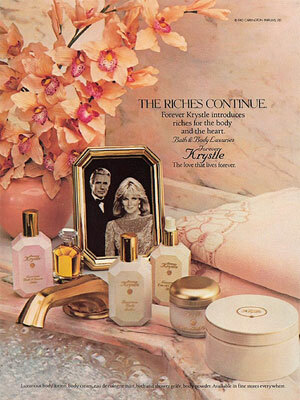 A fragrance created for her role as Krystal Carrington on the TV show Dynasty, that began in 1984. The masculine counterpart, Carrington, followed for her husband's character, Blake, played by John Forsythe. Forever Krystal is available in an eau de toilette spray (1 oz., 2 oz. ).